A bolt from the Black! Take a minute to look at this position. White has just played 22.Qxb7 and looks to be in complete control, a rook and two pawns up. Faced with the ‘inevitable’ Black finds a move that ends the game immediately. Can you see it? The game was played in the 1974/5 Hastings Masters between GM Rafael Vaganian from Armenia and GM Albin Planinec from Slovenia. Answer: 22…Qc7+! 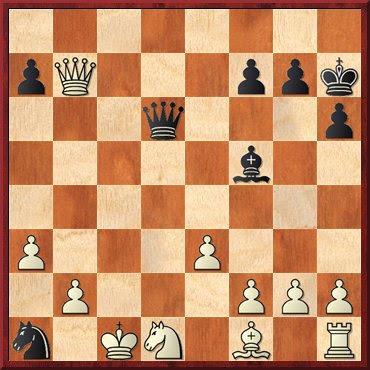 0-1 A classic deflection move, after 23.Qxc7 Nb3 is mate! Reference: 'Littlewoods Choice' ChessMoves Jan/Feb 2009, p.14.